[Solved] How to Recover Android Data with Black Screen? 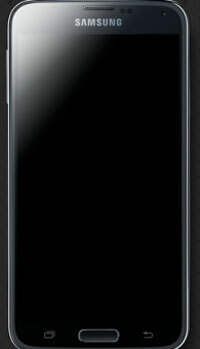 Home > Resources > Recover Android > [Solved] How to Recover Android Data with Black Screen? Summary: If your Android phone gets black screen or broken screen, please don't worry, you have come to the right place. This article will show you an effective way to recover deleted or lost data from Android phone with black screen or broken screen for your referece. First of all, I'm sorry to hear that there is something wrong with your Android screen. Actually it is not a rare problem because a lot of friends asked me the same question about how to recover data from an Android phone with black screen or broken screen. After all, accidents can be easily happened on your Android phone, for example, your Android phone fell out of your hands and dropped onto floor, or Android device is infected by virus, or the phone suddenly crash, etc. No matter whatever reason for your black screen Android phone, you can still restore the Android data back without hesitation. What you need is the Broken Android Data Extraction, which allows you to scan and recover lost and deleted data, such as text messages, contacts, message attachments, call log, WhatsApp data, photos, videos and audio files from Android phone with black screen. What Happen to Your Android Phone When It Gets Black or Broken? When your phone gets black or broken or cracked, the first thought should be attempting to rescue your data from Android phone. 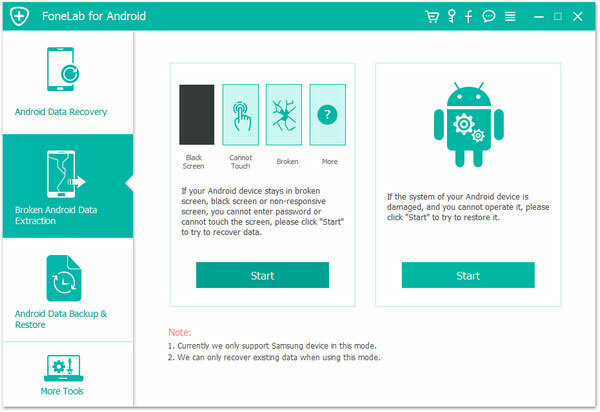 However, since your Android phone gets black screen or broken screen, you can't access and perform your Android phone normally as usual, and you can not export Android data by connecting your device to computer via USB cable as well, for you cannot manually enable USB debugging mode on your phone. In this case, what should you do to recover data from Android phone with black screen? Just take it easy, you can easily resolve this problem with the Broken Android Data Extraction. Luckily, you have the Broken Android Data Extraction now so that you can restore everything you want from your Android phone with black screen without hassle. With it, you can easily access your Android data without enabling USB debugging manually on your Android phone with black screen. 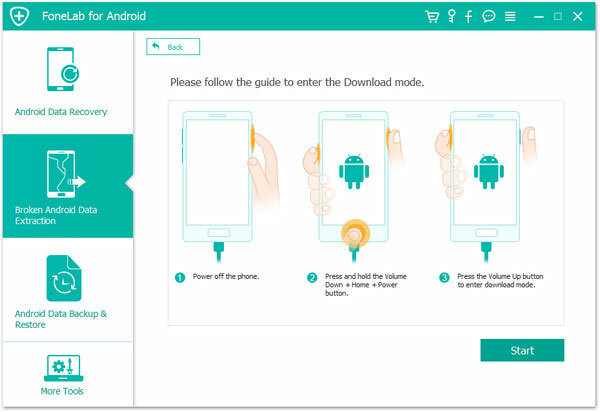 It allows you to enter the Download mode to scan your device for your Android data without perform the Touch screen. As mentioned above, the recoverable data includes photos, videos, music, audios, contacts, call history, text messages, message attachments, WhatsApp, WhatsApp attachments, documents and many more. Thus, you can recover both of media files and text files as you like. And all the recovered Android data will be saved as the original and non-damaged formats so that you don't need to worry about the compatibility after recovery. Of course you can choose the location you want to store those recovered Android files on your computer before recovering. Thus you can easily manage your Android data on PC/Mac if needed. Currently, this program only supports these Samsung models as below in this mode. For other Android models, our technicians are trying to make it support more phone models as soon as possible. Step 1. Connect your black screen Android to computer via USB cable, open the downloaded and installed Broken Android Data Recovery. 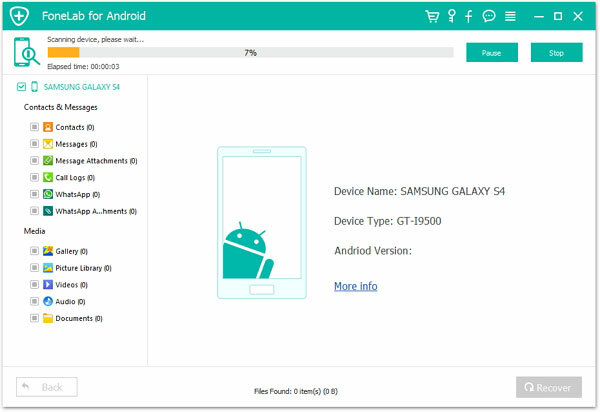 The program will detect the connected Android phone instantly. Click "Broken Android Phone Data Extraction" from the left. Step 2. Click the "Start" button and then choose your phone's name and model. 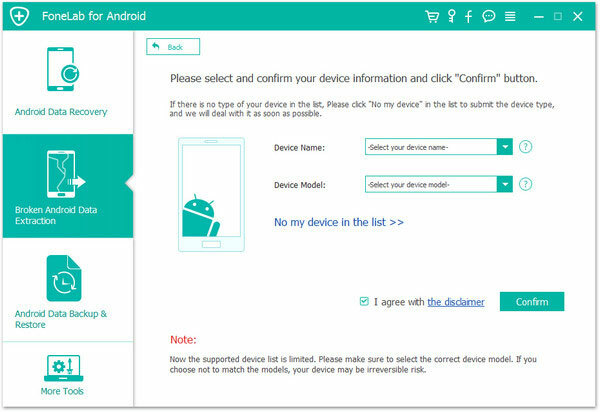 Then, click "Confirm" to see whether your Android phone is supported to be fixed by the program. Step 3. Follow the direction on the interface to enter the download mode. After that, click "Start" button to fix your phone. Step 4. After your Android phone is fixed successfully, the program will scan your phone data automatically. Now, you can enter the file types from the left sidebar and mark the data that you want to recover, click "Recover" to extract the selected files from your Android phone to computer. Apart from text messages, you could also recover contacts, message attachments, call log, WhatsApp data, photos, videos and audio from your broken phone to computer. How to Backup Android Data on Computer? How to Recover Deleted Contacts from OnePlus 5/3/2?